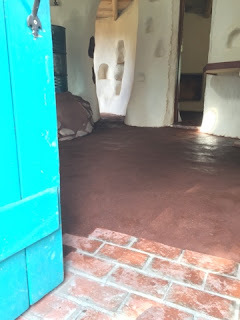 Earthen floors, cob floors, clay floors, adobe floors, and tamped floors are variations of a similar technique used to create healthy, sustainable, and beautiful mass floors. What do we mean by a mass floor? Thermal mass is effective at absorbing and storing heat energy. Think of mass like a battery. As an external heat source, like the sun, heats up a large body of mass, like a brick wall, this mass slowly releases the stored heat when temperatures begin to lower. This allows homes to stay cooler during heat waves and warmer when it is cooler. 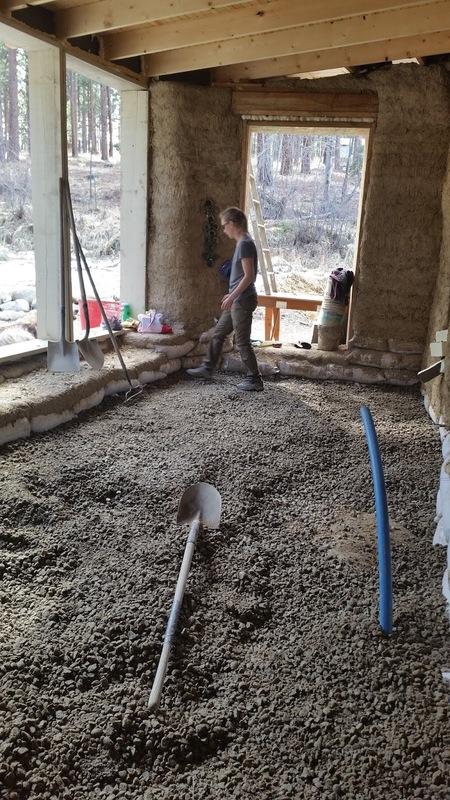 So how do you build an earthen floor? The floor is composed of a sequence of layers as shown in the image below. This is an area not to skimp on. The drainage layer acts as a capillary break and prevents moisture from the ground below your house to wick up into your floor. Any type of clean gravel material will work well. Pea gravel packs well, is reasonably inexpensive and provides great drainage. Other material like round river stone, crushed gravel, or pumice will work too; just remember to tamp whatever you use well so that it doesn't settle after you have finished your floor. You want your floor to be as packed and unable to shift as possible. While not strictly necessary, this layer is a great fail safe to prevent moisture from wicking up into your finished floor. You can use sheets of plastic, old billboard tarps work very well and can be found for free or near free at advertisement companies. Another layer not to ignore. This is the most environmentally unfriendly part of an earthen floor. Blueboard insulation or PolyIso sheets can work extremely well to prevent heat from leaving your house through your floor and into the earth below. The amount of energy you save in the long run by not needing to constantly heat your home will balance out the eco scales from purchasing these materials. This layer, if purchasing closed cell insulation sheets, can act as your moisture barrier as well. The base layer is at least 4" thick and provides the strength for your subsequent layer/s. We have used cob in the past to create a strong base, but can take a long time to dry. For those who are short on time, road base can be used to create an equally strong floor. Road base is composed of sand, clay and gravel that can be watered sparingly and packed down with a hand tamper. This layer should be allowed to dry completely before moving on to the next layer/s. This layer can range from 1-3" and is what you will be seeing for the rest of the life cycle of the house. 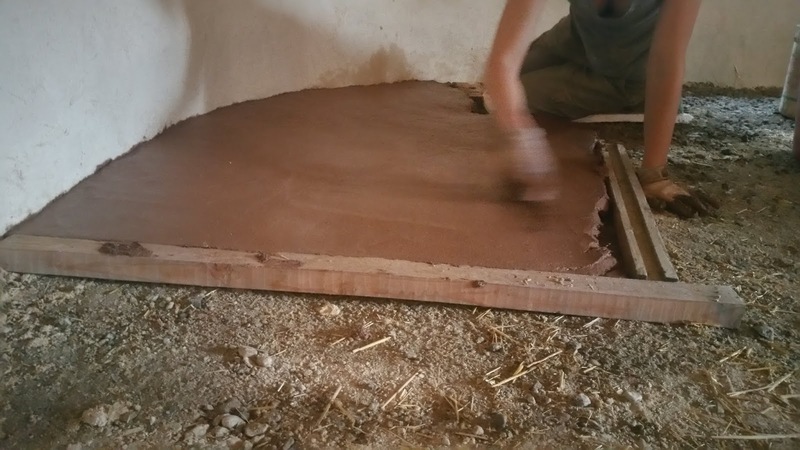 At this stage you want to use the same materials you would use for cob, just much finer. We sifted all of our ingredients--sand, clay soil, and straw--through a quarter inch screen. This material can be mixed together with water to create a floor material much wetter than normal cob, think thick pancake batter, and "poured" into place. In reality, the pouring stage is more like plopping bucket loads of batter and then troweling it on a horizontal wall. We use a 2x4 to keep our floor height level making our floors 1.5" thick. Remember that this may be the finished surface so use a finishing trowel to get the surface as smooth as you can. More layers can be added if desired or necessary. This subsequent layer can be as thin as plaster, its purpose only to give the desired finished look. The earthen floor should be completely dry before any oil is applied. 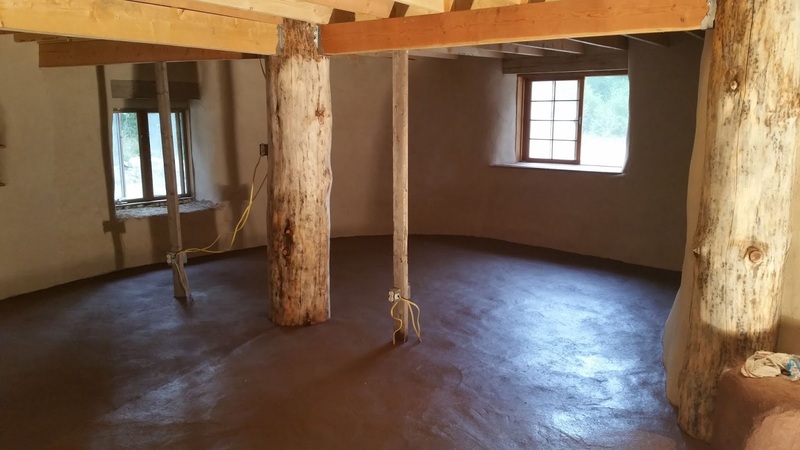 Earthen floors should always be finished with a drying oil. Boiled linseed oil is commonly used and extremely cheap. Alternatively harder drying oils like Tung oil can be used but will take much longer to dry. This oil can be applied as many times as needed--until the floor stops absorbing it and begins to pool the oil. Excess oil should always be wiped away or it may create tacky surfaces. That's all really! 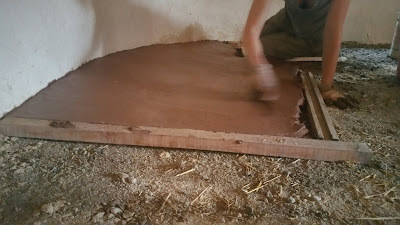 Of course there is many more techniques, tips, tricks to use to create beautiful earthen floors. We highly recommend purchasing Earthen Floors: A Modern Approach to an Ancient Practice by Sukita Reay Crimmel and James Thomson. 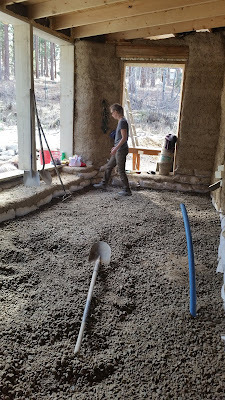 Also, check out this in-depth description of building earthen floors by Sigi Koko, a true master of earthen construction.